Our Round Coat Hook Hidden Spy Camera with Built in DVR is an easy-to-install coat hook houses a hidden camera and DVR. Keep an eye on your home and office by capturing motion-activated video. It records in crystal clear 1920x1080 resolution at 30fps on a 16GB micro SD card which stores 2.5 hours of footage. 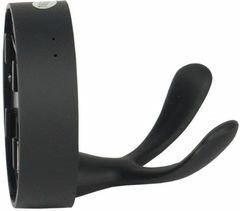 The coat hook hidden camera mounts easily to a wall using the included double-sided tape or screws. The motion detection feature allows you to record only when motion is detected. It has a 2 hour battery life and is very easy to operate. It easily connects to a computer to download and view video footage. Dimensions 2 1/8" x 2 1/4".